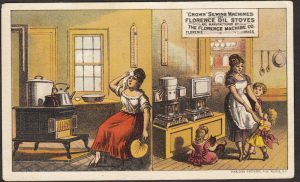 BEFORE she purchases a Florence Oil Stove, this mother swelters in the heat of her old woodburning stove; AFTER her purchase, she has the energy to play with her children. According to the implied promises of this advertiser, money CAN buy a mother happiness… as well as a joyful dance in a Happy Home! 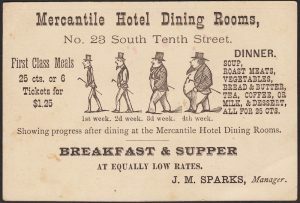 Most great business card images “tell a story” of a good life made possible by the purchase of the advertised product. 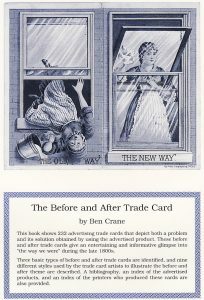 Ben Crane’s classic book, The Before and After Trade Card, tells the story of these cards that tell THOSE stories! 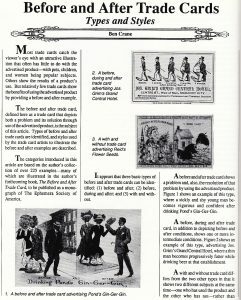 Back in the early 1990’s, Ben Crane was one of the founding members of the Trade Card Collectors Association. 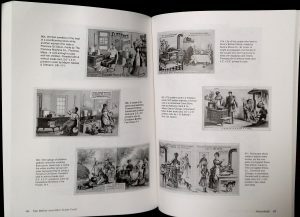 Before and After Trade Cards, Types and Styles, by Ben Crane. 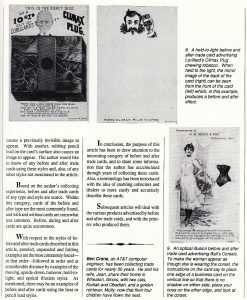 A year or so later, the Ephemera Society of America published Ben’s book: The Before and After Trade Card. 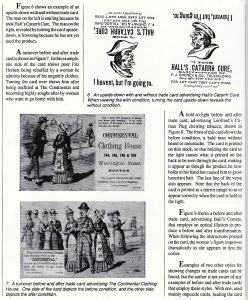 Below, we reproduce Ben’s article from the TCCA’s very first journal. Enjoy! 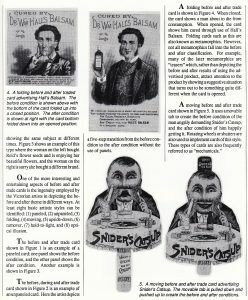 Some of the “Before & After” cards illustrated in this article may be available for purchase. Click on any card to see if that or a similar card is currently available. 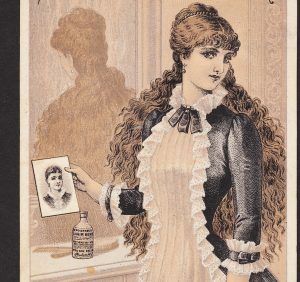 Click on any of the card images or reproduced pages to see what may be listed on ebay at this time. 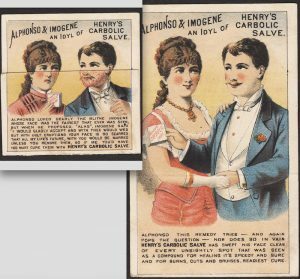 as well as mechanical cards and “With & Without” cards for sale, click on any of the linked images. 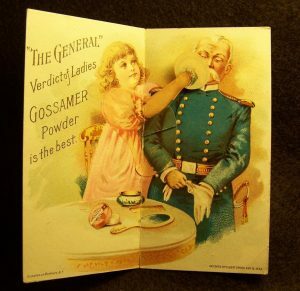 This classic patriotic HTL card was issued by the Everett Piano Co. circa 1893. 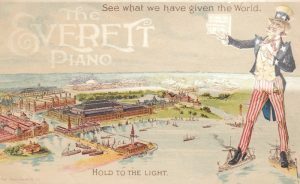 The front image features a spectacular bird’s eye view of the Chicago Worlds Fair Columbian Exposition fairgrounds, with Uncle Sam standing on White Fleet ships. 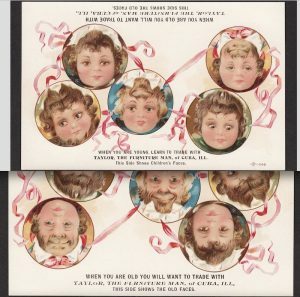 When held to light, the ad from the back shows through, with Uncle Sam now holding an Everett Piano in his right hand. 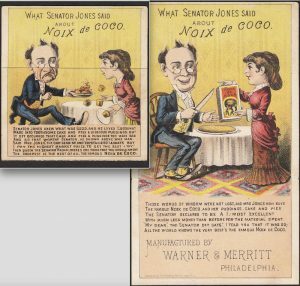 Metamorphic Folding Cards, Hold-to-the-Light (HTL), Mechanical Trade Cards, etc. 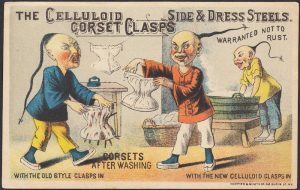 We close with this classic “Old Style” vs “New Style” comparison card featuring success and failure at a Chinese laundry based upon which product was used.